Fashion is a complex melting pot of sartorial choices, where almost anything goes as long as you add an intentionally on-trend component to the outfit. Individualism is the most important trend of all, and it’s extremely liberating. Now more than ever, we’re celebrating style diversity and the many, many ways to look stylish. Take the PERSONAL in personal style to heart because you have the power to pick and choose from the trend buffet, and sport it your way. After a well-received trend report, here are my suggested must-haves for the cold-weather season. They cut across all body types, ages, price points and lifestyles. Rock them heavy or rock them lite. Think colours like all shades of tan, cream and chocolate brown, toffee, cinnamon, olive, burnt orange, cognac, harissa, mustard, camel, sage, forest green, taupe and a very brown shade of burgundy. Wear earth tones across any clothing item, pair of shoes or accessory. Stick to brown leather or wear earth tones in a pattern if that’s more your thing. And feel free to wear earth tones with your favourite colours. There’s an animal print for everyone. There’s classic leopard and cheetah that goes the distance, but don’t forget giraffe, pony, cow and snakeskin. Think animal print in neutrals AND non-neutrals. Any colour of animal print is fab, and in any wardrobe item. Wear it as a statement clothing item, or stick to accessories and footwear. Bootcuts that are NOT cropped are back with a vengeance. Wear them with a higher rise and showcase the rise with a tucked, semi-tucked, or shorter top. Sport them with sneakers, flats, or very low heels for an updated look. Think Western boots in any way at all. Cowboy boots are having their fashion moment, although they’re an iconic classic. 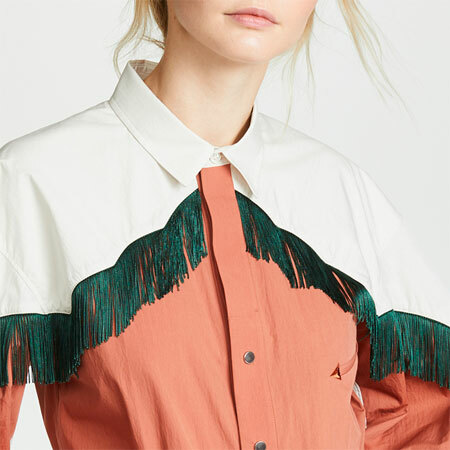 Think belts with western buckles, tiered skirts, ruffled shirts, prairie dresses, fringed jackets, suede, and cowboy shirts. A true Christmas red is THE red of the season, but feel free to sport any shade of red across any wardrobe item. It’s a versatile colour that works with just about any neutral and non-neutral to my eye. And if you dare, sport it with shocking pink. It’s about wearing “it all” together to create a harmonized whole. That means remixing patterns, textures, colours, layers and silhouettes, because the only limit to the aesthetic is your own tolerance for the combination. Sport multiple accessories, combine a range of colours and patterns, dress in multiple visual layers, and don’t forget dramatic nail polish, rainbow hair, and make-up. Feel free to interpret maximalism as fully as you see on the catwalks, or tone things down considerably. Structure is about accentuating the actual shape of your body, like defining the waist and hips, the shape of your arms and legs, or the shape of your shoulders. So think TAILORING. Sport beautifully tailored jackets, dresses, trousers and skirts. Sport form-fitting tops. Add a waist-defining belt to outfits. Wear jackets and coats with waist ties. Tuck and semi-tuck tops into bottoms to showcase waistlines and high rises. Remember that a structured outfit needn’t be structured or body-con from head to toe. A fit-and-flare dress is structured up top, but voluminous from the waist down, creating a balance of tailored movement. It’s a jacket and cardigan season, and not a pullover season. That means that knitwear is simple and basic so that it can be layered under a jacket like a blazer. Remind yourself of the beauty of the blazer, and sport one. A longer length ‘90s inspired blazer looks the most trendy, although short blazers look awfully good with flared dresses and skirts. Blazers don’t need to be stiff, corporate and conservative. They can be fun, festive, and a nod to the Structure trend. Blazers can also be layered under coats so that you can wear them through Winter. Individualism means that it’s thoroughly modern to be Modern Retro. The most universally stylish, and probably your favourite silhouettes date back to fashion eras gone by, which we can remix today with a good dose of Current. Pick an era(s) and weave its sensibilities into your style. The ’70s, ‘80s and ‘90s are particularly popular at the moment but if you’re a ‘60s gal, or love the ‘20s, ‘30s and ‘40s — go for it. I’m hopelessly devoted to the ‘60s, ‘70s and ‘80s. Longer length skirts and dresses are the most on trend. 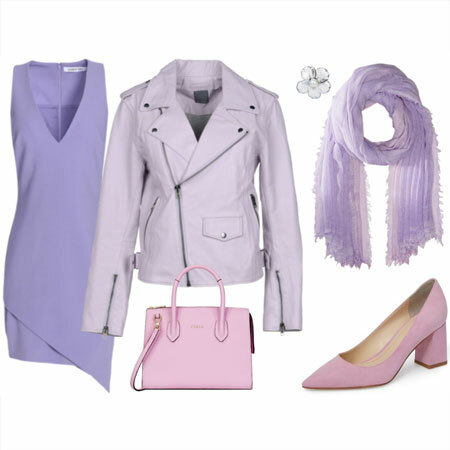 Choose heavier weight dresses with sleeves, add fun hosiery, jacket/gilet, any length of boot, a scarf and statement coat. Or combine Winter skirts with knitwear, hosiery, boots, oxfords or pumps. Throw a blazer, jacket and/or coat over the top. IMPORTANT: You do NOT need to be tall to wear midi lengths. Wear the lengths in proportion to your height and you’re good to go. My 4ft 9 friend rocks midi skirts with flats with the best of them. Enough said. It’s all about showcasing a high or very high rise in all sorts of pants and jeans, which means tucking or semi-tucking tops. You can also wear a shorter roomier top to showcase more of the rise if you’re not a tucker. Go for a mid rise if you’re short in the waist. Showcasing the high rise of jeans and pants is part of the Structure trend, but you don’t need to wear tight bottoms or a form-fitting top. You can indicate the rise and waist by semi-tucking a fluid top and wearing bottoms that are a relaxed fit on the thighs. Think any type of check, tartan or plaid in any neutral or non-neutral, and in any wardrobe item. Pattern mix the checks with animal print, if you dare. If a plaid scarf is the only way you sport checks, that’s fab too. 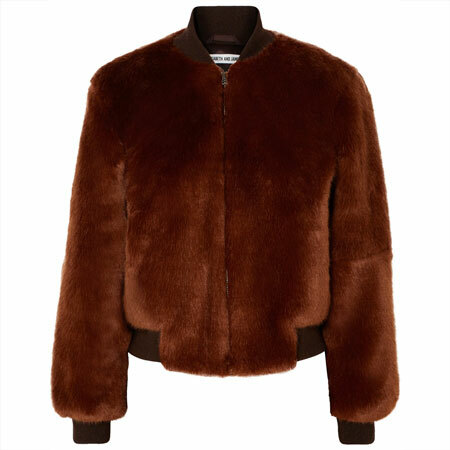 I can’t think of a more practical and popular coat than some sort of puffy topper. Short, long, neutral, non-neutral, tailored, classic, cropped, sleeveless, avant-garde, thin, thick, sporty, equestrian, sleek, voluminous – there’s a puffy topper for every climate and fashion persona. These days you can wear a puffer over a ball gown with sneakers and look fashionable. Gone are the days that you were at a stylish disadvantage if you couldn’t wear high heels. In many cases flats and low heels look more current paired with outfits, and are more practical and authentic too. The very low heel in particular – between an inch and an inch and a half – is having its fashion moment across ALL heel and toe box shapes. Sneakers can be worn with just about anything these days too. May this trend last forever. We think of floral and botanical patterns as a Spring and Summer vibe, which is a dated way of looking at the pattern. Wear florals in Autumn and Winter and have fun pattern mixing with them. Wearing florals with dark backgrounds, in moody colours, or in earth tones might help break the seasonal stereotype. A wild card is an item that is atypical for your style persona, but that speaks to you in some way. Adding a wild card to your wardrobe is an excellent way to evolve your style, making it feel extra refreshed for the season. They can be a way to solve a style and fit challenge, or to temper your poison eye for a look. Wild cards can be new colours, vibes or silhouettes. Or a new way that you wear your hair, your make-up, or put together your outfits. Wild cards always make my must-haves list because nothing ventured, nothing gained. 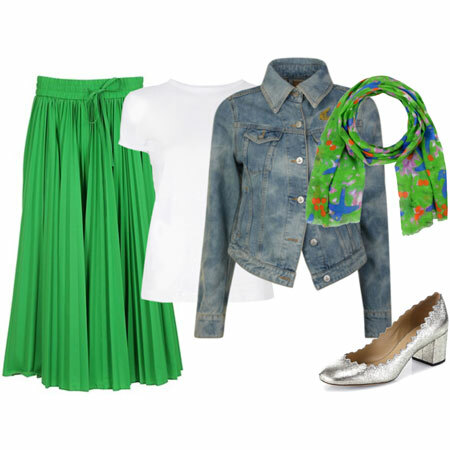 Remember that these items have to mesh with the factors that affect your style. Pander to your style descriptor, whether that’s rocker, avant-garde, boho, preppy, arty, corporate, casual, urban, dressy, trendy, folksy, sporty, girly, rough-around-the-edges, moody, elegant, polished, sophisticated, classic or hard-edged. Find the renditions that best express you and your style. Personally, I’m all over ALL sixteen must-haves, and apart from long blazers have all of them represented in my wardrobe. I will continue to refresh along these lines and enjoy the small and larger shifts in my style. I’m grateful that trends are diverse, that size ranges are extending, and that individualism reigns supreme. Well, here it is. Quite a list for F/W fashion fun. Apart from animal prints and full-on maximalism, this season’s highlights tick a lot of boxes for me. Love those retro (to my eye) pants suits. Swoon over the one that reads tangerine red on my screen. Love high rises, midis, flats in any season; will wear full length bootcuts a bit as weather permits, will grab a longer blazer, happy to find my version of floral and it’s all good. Thanks again for another thoughtful analysis. Helpful as always. Yay! my favorite season! It’s a mixed bag for me this year. I’m excited by: full length bootcuts, red, maximalism,structure, 90’s flair, midis, tartan, flats and low heels and most of all florals. Going to skip for the most part: earth tones, western wear,long blazers, high rises, and puffers. I’m not opposed to animal print but only own a couple of accessories. I’ve just come out of winter, so this will be useful in 6 months time. The trend that I got into this year: earth tones, cinnamon and olive coats, and other pieces to work with these, red always a favourite colour for me, maximalism, 80’s, animal print speaks to my 80’s gene, flats and high rise jeans. Interestingly I have puffers and did not wear them at all, preferring to wear my new woollen and velvet coats. Western style is yet to become available locally. I am not sure about Western style. As I am not from the USA, it feels a bit contrived on me and a bit too rustic for my style. I will need pretty and refined Western boots. In Zara this week, I spotted a rack of long blazers and was smitten. Have a feeling that could be my wild card this season. I haven’t been a blazer person for a while, so it would be fun to throw myself a curve ball. I am very happy about this new season, I have been waiting for return of 3 – 7 for quite a while, love these “trends”. I still need to adjust my eye to longer blazers, midi dresses and skirts and highlighted longer rises on me. But it will come. This fall, I am trying to introduce more earth tones to my outfits, which would not be my usual, most flattering colour palette. I will use them in combination with “my” colours – black, cool brights, white and cream. Thank you very much, Angie, for the wonderful trend posts. Extremely helpful and fun! First will have to say I feel we are always at least 1 season behind your list in mass-retail but it is so helpfull to know what is curent and hip. Looking at your must haves I will somehow thick almost all the boxes this fall, my way of course, but anyway this surprises me a lot! I guess it is because as you say, gone are the days when trends changed so quickly and..”Fashion is a complex melting pot of sartorial choices, where almost anything goes as long as you add an intentionally on-trend component to the outfit”. Even unconsciously this prooves to be right up my alley at the moment. Now back to the work. My very wildcards were add in already in January like 2 much needed prescription glasses (in dark burgundy and brown animal-cat eyes) and these immediately called for adding more contrast on my face like a darker make up routine including darker lips which I didn’t do for 25 years! I admired so much Broocklyn’s florals but I found them available in my tastes only this summer, so got me some dresses and tubes, even pants! I stocked up a few culotte, as a nod to the flare hem trend you mention, including a very wide brown and burgundy tweedy one for fall, now this one is a wildcard again. I plan to wear with flat patent loafers. Wedges or block heels (in 1-2″) are the most flattering-and still doable for me so I stocked up on these -and even found an OTK sock boot with block heel- which I plan to boss it just under the knee height for my lukewarm style and happy! As a tall and chubby girl never gave up on midi lengths, high rises and some structure but am so happy these are now mainstream, too. Plaids. I may wear them in a few of my winter bottoms but is my least favourite print for tops. That been said, I’ve just bought me a plaid AND floral tie blose (in grey with some green, burgundy and mustard) for work. Will wear with my black and grey essentials. Oh, and I did buy my first gingham (bl&w) pants ever (and a capri length)-which I wore with colorful paisley and floral tops -for work(!). Now, how does this all sound for keeping up with the maximal trends this year? I am not a conscious pattern mixer but I swear this was comming so easy for me now. As always, thanx for the head ups, Angie! I don’t have any blazers in my wardrobe right now, so I’m really interested in adding one or two to my wardrobe. I did really love them last time around. What a fun post and one of my favorites, as you know, Angie. Thank you so much for all the work you put into this! I already have all of these in some form and amount (minus the wildcard) in my closet. I will be heavily shopping my closet and not buying much this season, and most of mu purchases will be to complete a mini-capsule already existing in my closet based on some of these trends. 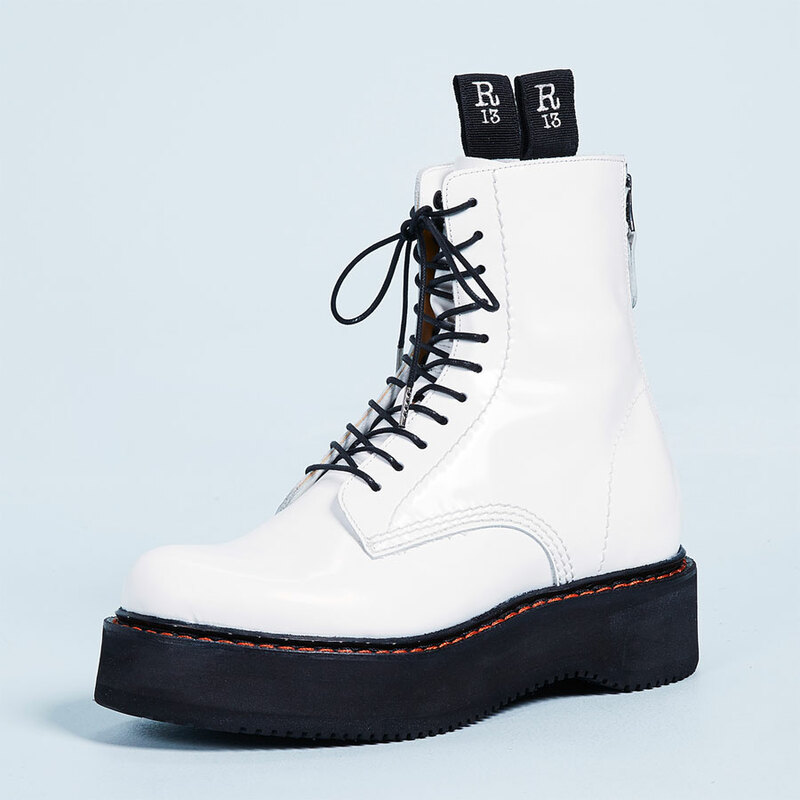 1) those that are very me, and I always loved regardless of the tends, so I plan to wear them a lot (e.g. structure, high rises, plaids, dark florals, long (though not super long) blazers, midis, moderate maximalism, certain retro eras, puffers, flats&low heels). Typically I already have decent amount of these in my closet, tough I may ad a piece here and there as necessary. For example, any pants I buy must be high rise or on the higher end of medium rise. 2) some that I like but are not so me/don’t have much of them, so I am experimenting with them but not overdoing it. This is the focus of my shopping for the season, building a couple of mini-capsules around them. These are earth tones, true red and full length bootcuts. 3) the final group is those I plan to do a very small nod to, and those are animal prints and western wear. Most animal prints I have are in shoes (especially snakeskin) and scarves, and I keep changing my mind on adding a full leopard clothes item, most likely a grey leopard coat. Western wear is something I will never do a full look of , just some touches here and there, like a classic plaid shirt dressed up with a pencil skirt, a belt with a western buckle (mine is lilac and pretty subtle). I don’t have nor plan to get true cowboy boots, but again, have a pair or two that are very subtly inspired by them. It was funny, I almost started laughing reading this list. I’m nodding away, yes, I always do this, no I will enjoy this on others…and I realized what I am taking away from this is to “just continue to be me” In or out, I wear many of these items, more or less depending on mood and I’m sure buffeted by the waves of trend. Some years more cowboy boots, bootcuts more than skinnies, some years more houndstooth than plaid, but they are always there depending on what is available. I feast on the things I love when they are plentiful and save/reserve during the lean years. Right now my style is having a boon year, long blazers, bootcuts, flats, plaids, equestrian/cowboy, but at the heart I’m always looking for the “me” in what I see, and that’s a really good place to be! Great list to get me in the mood for fall! I like most of these, struggle with a few, but have written up the list to put in my wallet and remind myself. The wild card is always a question for me. I have a faux fur vest that has been a fun wild card for me the last few winters and would love to find something like that for this year. Love your first photo example, I would wear it exactly as is. Great list Angie. I was with you up until puffers. There are no puffers for this gal in this climate I suspect I won’t embrace the western trend either, for the same reasons as Bijou. For everything else I have a very open mind. I am particularly enjoying the resurgence of earth tones and plan to stock up. Thank you for your report Angie! May I also mention I’m seeing a lot of tweed being worn irl here, which is nice :). I would like to experiment with some earth tones, I used to wear chocolate brown and it was very soothing and easy. Also I’m excited to play around a little with red…. not an easy or soothing colour for me but nevertheless there’s some interesting possibilities with it. I like the idea of bootcuts, but for me I get frustrated when the hem gets damaged from touching on the ground…. so I’m not sure. Great list, and many things I’m already doing — or planning on doing, if fall ever gets here! I’m looking forward to trying out my neglected cowboy boots again, with bootcuts! I’m thinking about a little red, since I now have some red in my hair. I only have a little bit, as somehow when I own something like a red jacket, it inevitably goes unworn. But I like it, and I don’t think it looks bad on me. I’ll have to pull out some of my red-accented pieces (a sweater, a couple of scarves, a pair of booties) and see how they feel. I never invested heavily in animal print last time it trended, but I still have a couple of items. I wouldn’t mind something in a nice cool snow leopard or zebra print, but I’m not knocking myself out looking, as I feel like I’ve done enough shopping for a while. Maybe I’ll find something in South Africa! Still not really embracing the look of the highlighted high waist on me. You suggested semi-tucking, as I do with mid- and low-rises, but a semi-tuck on a high rise has looked very awkward when I’ve tried it — I think perhaps a higher rise is best left un-highlightted on my body. I’m looking forward to adding a few updates, 1-2 more midi length dresses or skirts, animal print scarf, red sneakers, perhaps a red blazer. I just added a forest green dress from Boden, and I’m so glad my NAS purchased (floral silk scarf, navy tulle midi skirt) are fitting in with these trends. Your trend posts are some of my favorites. It’s such a help in terms of training my eye, and ensuring that my wardrobe stays reasonably updated. Half of these are at the top of my fall/winter wish list: puffers, boot cuts, structure, florals, flats/low heels, earth tones and a wild card. I have just added a burgundy puffer (REI) and bootcut jeans (WHBM). Florals, bootcuts and structure have always been present in my wardrobe. I am leaving tomorrow for a two week trip to England/Scotland and hope to add to my fall wardrobe on this trip. Especially a wild card! 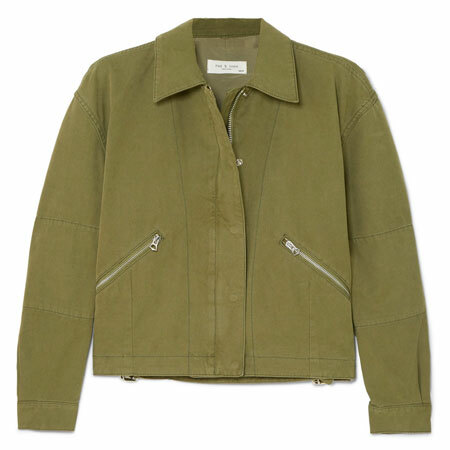 Looking for a quirky jacket (moto, blazer, other?). Letting serendipity play a role. I am a big fan of Clarks, especially the UK options unavailable in the US, and hope to add a pair of flats, too. A great list, and I have several of these items in place already; hooray! On the wishlist, something red, and something with a glen plaid patter – maybe even a longer blazer! Sounds good to me! I have nearly all these, except earth tones (but I do have creams and some brown basics) and long blazers, which I really like, but can’t figure out yet. On the 1” heels, I’m wrestling right now with whether that’s a good height for me, and possible to use in a punk/RATE way, or just frumpy. Note to Bijou and Brooklyn: dress code for GW Bush’s inauguration ball was boots & tux, and there were some mighty fine boots on display. There are equally fine, dressy Western boots for women with elevated style. If you’re interested, I’m sure you can find some that work for you. Nodding along with this whole list. I am set with just about everything except the high waisted bootcuts, but I will find them too! I love the thought and care that you put into these posts, Angie. Each must-have is not only described, but there’s the “why” element too. I haven’t had much of a chance to do any real shopping yet this fall, other than to pick up a few quick things, and I don’t have anything on my list other than to try some higher rise bootcut jeans . I’d love to replicate the outfit with the plush leopard print jacket and high rise jeans posted above . I’ve seen a few longer blazers that I like, but I have little use for them in winter. 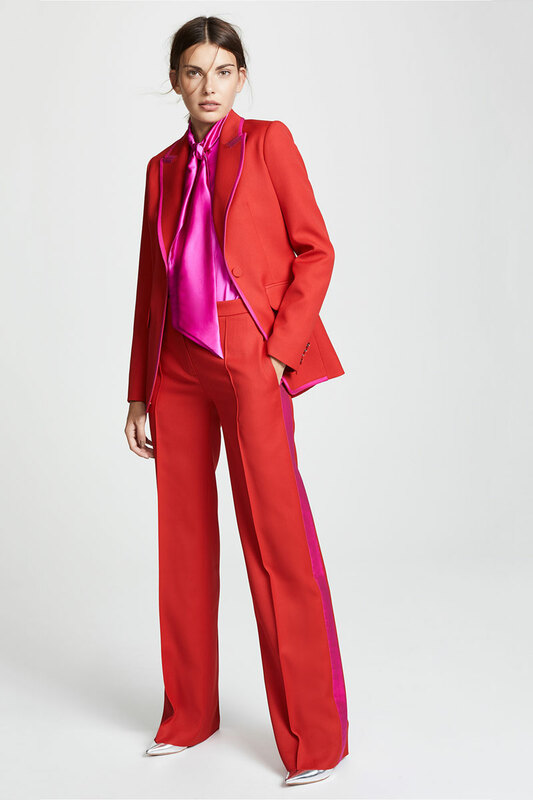 One thing that IS on my to-do list is to figure out how to style a red military-style blazer I bought last winter that has so far gone unworn (Suz and I have the same one). I’m more comfortable with red than I ever have been and would like to figure this jacket out. I’m not into Western wear- it feels too contrived and inauthentic on me – although the resurgence of the Western-influenced low cut bootie has my interest. And lastly, plaids and checks aren’t me – too masculine for my comfort zone. Hmm. I’ m going for the plaid (maybe) the higher rise, red and midi. Not keen on earth tones for myself. This list makes me very happy, in particular the bootcuts, structure, midis, plaids, flats, and RED! For me, plaid, western, mustard, flats. I’ll probably add others along the way. Wild card? I guess we’ll see. Lots to love in the list! I like all of them and can shop my closet for lots of them. The wild card for me is perhaps the longer length blazers and western wear. I have a white leather fringed coat that I found at a thrift store and used it for Halloween. I may dig it out and wear it as an “every day” coat for fall, just for something different. One thing that I’m noticing in many stores and advertising are longer length blazers in checks or plaids, paired with short mini length skirts (not midis). Perhaps the mini lengths sell better for the younger demographic? I love this post as a way to evaluate my fall/winter wardrobe. The warmer items have not yet been brought out…too warm yet to even try on. Going over the list I have most areas represented. Refreshers have included mid- rise pants, a plaid flannel shirt with a ruffle and Western styling, some earth tones that are not really neutral like rust and a touch of mustard. From NAS, a puffer vest, plaid jeans, and earth-toned leather jacket. I want some fall and winter floral and have added one fall floral top in fall colors for warm days. Still wanting a mid or high-rise boot cut jean. I want it ALL!!! Am slowly adding some darker browns/mustards, want an additional pair of bootcuts, and just about everything here makes me smile in one way or another. 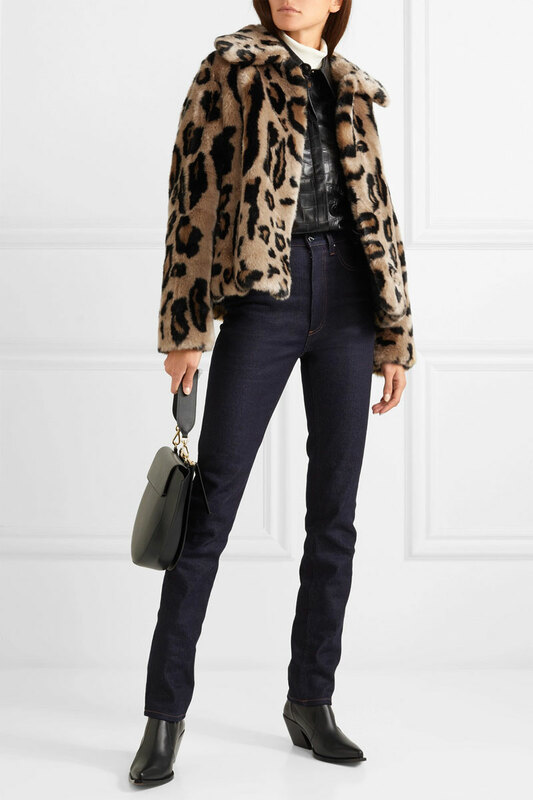 I have that dress shown above and would love to get a leopard print jacket like the one shown with the dark jeans and black footwear/bag…just would prefer a regular fabric rather than a furry fuzzy one. I think I’ll put that on my list, and be patient. As lyn67 said it seems to take a while for trends to make it into stores…. Great list, I have several of these items. I am very happy about this new season. I love pictures 3,4 and 5, fantastic. I will try red and fuchsia instead of shocking pink. A fabulous list. Thank you! And the descriptions are very helpful. Makes me realize just how boring my wardrobe is. I need to branch out — a lot! Trying to put together a travel capsule for next month.. hmm need to see if I can’t find a wild card to jazz it up. Going to see old college chums and really want to feel fab and avoid frumpy and boring. Love love love every single thing with the exception of the longer blazers. Maximal Mary is very happy this season! Tanya thanks for finding that more affordable furry leopard moto…I may think about it…so cute! I love this! Thank you, Angie, for all your hard work. I have always embraced earth tones (no secret) and just purchased a pair of chocolate brown booties. I am also interested in that Stand leopard faux fur jacket. I have seen similar ones in our independent boutiques. I am in the market for a new blazer. Not sure about the longer ones. I will have to try them on and see how they look on me. Thank you, Angie! I always love these posts — they get the inspirational juices rolling and help me focus on autumn shopping, which I generally don’t think about between NAS and …well…now! Trends I’ve already begun to embrace: RED. (And I would also love to combine with shocking pink — a favourite combination of mine. That pantsuit is gorgeous!!) Midis (been wearing them for years…). Lower heeled and flat-for-me footwear (not dead flat like a ballet flat because not supportive enough.) Higher rises. Structure (yay for blazers! ), florals, tartan, puffers (ha!! no kidding!). I also do what I might call “western lite” — I have a denim western shirt I wear a great deal either with white jeans or burgundy, or with dressier items for juxtaposition. Full length boot cuts — at least in theory! I know it will be tough to wear them in my new climate as much as in my old. But I’ll look for a great pair of higher waisted jeans in that silhouette. Animal print: I loved leopard as a blonde and still have a leopard bag and belt, but I really love a black and white pony print for my new hair colour. Earth tones: I’ll be cautious with these because they don’t work as well with my colouring or overall wardrobe, but I adore cognac and would love a cognac bag and boots. On the lookout. Forest green is lovely on me and could be my substitute for earth. Some olives also work depending on undertones. Maybe an earth tone item will be my wild card! Wow, I’m excited about this list, Angie. I am really wanting to wear more brown tones right now–looking forward to wearing more brown footwear. And from your description of maximalism, I think I probably can get behind that trend pretty easily with “visible layers.” I hadn’t thought of layers as being maximal; I had associated the idea with mixed patterns and lots of accessories. Lots of fun stuff to incorporate: I love red and pink, animal prints (YES giraffe, zebra, and snake in addition to leopard and cheetah!) and a short puffer is a way of life in my city. Perhaps this will be the year for my HEWI of a long, warm leopard coat that fits with my preferred look—a little punk glam, not too 70s with a huge collar or menswear tailored a la 40s…, but more like a Grey Gardens type 60s RATE fit. Excuse the brevity, ladies. Flying out this afternoon and there are always last minute things to do despite how organized I try to be. Read all your thoughts, and am delighted to hear how excited you are. Me too! Glad you enjoyed the post, even if you have to wait six months in the Southern hemisphere. Tanya, as ALWAYS, you have it all figured out, and have the BEST wardrobe. Laura, GO FOR IT. I want to see which long blazer you get. Gryffin and Style Fan, YES! Milk your fashion moments. Brooklyn and Bijou, you come to appreciate a puffer in colder climate. Rock your wool coats instead, ladies. Janet and Torontogirl, GET RED. Toban, FUN. Show us what you get. FashIntern, I wear LOTS of one inch heels and don’t feel frumpy. I feel fab I cannot imagine you looking frumpy in the glorious heel height. Whoooo, Shevia. I LOVE my new toffee bootcuts. You will too. Becky, milk your favourite red while you can. Blue Jay, I think you’re right. Suz, HAH. You are gracious and wise as always. Milk the red and YES to wearing it with shocking pink. DELICIOUS. Love your wild card ideas. Yay, the fall trend list! I’ve been struggling a bit with the whole maximal trend. As a tall woman, I feel I’m already as maximal as I wish to be! And much as I love some of the delicious shades of brown, a lot of them don’t love me back, so I’ll mostly enjoy them on others. For me, yes to a few of the earth tones, full-length bootcuts, red, and long blazers. Also midi length skirts and dresses, florals, and flats! There’s a lot I can work with without going overboard on the maximalism. Lots to love on this list! Thank you for sharing, Angie. These kinds of posts are very helpful. I’m particularly pleased that 90s-inspired long jackets are on trend, since I have a burnt orange one (earth tones, check!) and recently found a black one that I love. It *looks* structured but is actually made of a soft corded tencel that hangs really nicely. I might also try full-length bootcuts — haven’t worn a pair of those in quite a while, but I used to love them. I’ll need a new pair, as I passed on all my old ones and they would be too low-rise anyway. Green and brown earth tones are already fairly well-represented in my wardrobe, as are flats and low heels. I also have some red accessories (handbag, shoes, boots) but could use a bright red dress maybe? Higher rises are tricky on me, but can be done if it’s only around a 10″ and if I semi-tuck my top. I’ve been collecting tops that work with this look for about two years now! Very much feeling 1, 2, 7, and 14. (Well, flats have always been a part of my look, by necessity, but these days I’m diving in to the joy and fun of footwear!) Re #1: I tend to gravitate towards black as my neutral. Would like to shift this to include some earth tones. High rises! Earth Tones! Checks and **TARTANS**! Midis (which tend to fit tall me more like long minis but hey, I’ll take ’em)! These are my Happy Place. I love and wear several of these trends already, in particular forest green, animal prints, full-length bootcuts, red, structure, longer blazers, midi skirts & dresses, and low heels. And I recently purchased a forest/bottle green lightweight puffer jacket that I intend to wear as outerwear in fall, and as an indoor topper in winter. When looking at my fall (and especially winter) wardrobe, I see PLENTY of grey and black items. Luckily, I do have several colourful tops, scarves and shawls. However, I’ll be on the look-out for more non-neutral bottoms, toppers and footwear to brighten the long and dark winter ahead of me. Lots of great ideas – some which I already have (dark florals, high waists), others I am keen to try (earthy tones, red and a long blazer) and one or two that are not for me (western and plaid)…but who knows!!! Thanks for the great roundup. I hope the longer skirts and dresses and the trendy flats trends last a LOOOOONNNNGGGGG time! Selections are so much better than in previous years! Late to the commenting party, but this list makes me realize that this might be my favorite fashion time period that I’ve yet lived through (born in ’76). Working a small wardrobe but participating in most of these trends, including earth tones, long blazer — a floral long blazer with waist structure! — full-length bootcuts, animal print (accessories only for me), a plaid midi skirt, and flat footwear. About the only things I’m skipping are red and western styles! 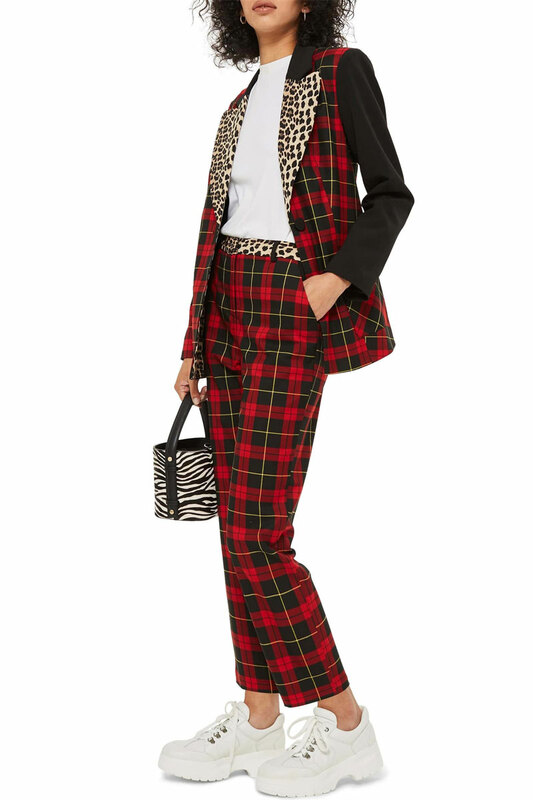 Will have to think about pairing plaid and animal print together, might be too maximal for my Modern-day Aristocrat style moniker but I’m willing to give it a try! Thank you Angie, I will be returning to this excellence post for reference as I transition to autumn. Can you recommend a longer length boot cut brand for buying new jeans? I love Madewell so will start there. Not sure how wide to go, and my look is more tailored and polished. I will be rocking my earth tones, that I have always loved, my leopard scarves and belts and will try and figure out what to wear with my leopard kitten heels. They haven’t ever been worn, so I guess this is the year. Also bought a long line blazer, and a cool red sweatshirt inspired top. I love brown and red, and will probably start there for mixing things up. A brilliant distillation, thanks. I have felt out of kilter with most trends of the last few years, so I will keep these points in mind to avoid falling out of fashion completely. My small steps will include some long bootcuts and a midi skirt to wear with tall boots, but I am very open to the allure of a wild card–preferably in puffer form! I’m particularly happy about the full-length flared pants, plaid, red, florals, and flats and low heels because these are things I’ve never stopped liking. Thanks Angie for all your work. Looking forward to high rise, full length pants, flats, structure, and dresses. I will skip, western, long blazers, and most earth tones, unless a bag. Great post! I love having all the trends and must-haves listed like this. I don’t know where I am on any of these actually – it’s still warm enough that I haven’t really thought about fall/winter clothing. I recently bought a jumpsuit so I’m calling that my wildcard. Thank you for this list Angie. It reminds me to step out of my box, experiment with how to make trends my own and take a risk. Immediately I dismissed the western look. But now am inspired to find something western but still me. May end up being beautiful coyboy boots which might also be my wild card. Hope that’s not cheating. I have worn most of these things for years without worrying about trends – I just wear what I like – but there is one thing on the list that I am thrilled about, and that is full length bootcut jeans!! I like the look of skinnies more on other women, and after buying and wearing some for the last two years, I am happy to pack away all but one or two. I rocked my favorite Hudson’s with a tall heeled wedge bootie the other day and felt great in my jeans again! I’ve always loved sheath dresses; I don’t think these could ever go out of style, and I think my wild card this year might be to up my Audrey Hepburn a bit. No go on long jackets – I’m only 5’1,” so I would definitely look like David Byrne in that. And no no no to high rise anything! Yuck! They make me cringe with memories of the 80’s! Please tell me that acid wash on high rise jeans will never return?!? And primaloft makes having to wear a warm coat during the cold wet Ohio winters so much less annoying. I no longer feel like a kid in a car seat when I’m driving or have to stuff a big puffer into shopping carts only to have them pop up like a jack-in-the box or an air mattress when I move the things that I needed to use to mash them down. Thank you for your work and the fun read! Earth tones on trend this year ? I buried an evil cowlneck sweater in the back yard… That sure made it earthy enough ! …Mwah-ha-ha-haaaa !